Movie Review: Hirokazu Koreeda is certainly one of the most interesting contemporary Japanese screenwriters and filmmakers of our times. 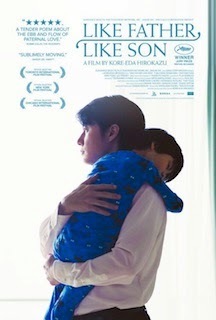 His latest film, “Like Father, Like Son”, despite not so irresistible as other previous works, presents us an inspired plot that bestows a different perspective to the so recurrent theme of switching babies at birth. As usual, the concept of family is the central point, here adorned by a quite curious character study of Ryota Nonomiya, a successful businessman but also an absent and demanding father who tries to prepare his son, Keita, to one day become like him. Contrasting with his good-natured wife, Ryota can’t hide his frustration when Keita reveals some difficulties to become the model he aspires. When the Nonomiya’s were informed by a public hospital that Keita is not their biological son, Ryota tries to get the custody of both kids. Once his plan failed by the refusal of the Saiki family, which showed to have a completely different posture in life, he seemed promptly decided to give up the child he raised for six years to recover the one of his own blood. “Like Father, Like Son”, adopting a more direct storytelling, didn’t evince the introspection or subtleness of “Nobody Knows” and “Still Walking”, or the sense of adventure of “I Wish”, but was able to maintain well elevated the levels of sensibility and simplicity of processes. With a fabulous direction and a particular ability to enchant us, Koreeda keeps depicting grounded family stories in a consistent way.